Do you desire to have a better understanding of the New Testament? Sure you do! We all desire to know Jesus Christ better. The New Testament was written in Greek or Aramaic. The inspired Word of Jesus is in Greek or Aramaic, not English. All Christians need an understanding of Biblical Greek or Aramaic. Now there is 'Greek in a Day'© which is a one day seminar. The seminar is taught by Dr. and Sister Klein. Dr. Klein has written a couple of booklets and a book on Biblical Greek grammar. 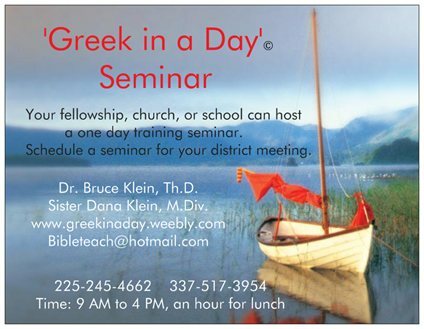 Call today to schedule a 'Greek in a Day'© seminar. Call today to schedule a 'Hebrew in a Day'© seminar. Dr. Klein is an Apostolic Minister who was born in Cleveland, Ohio, and started teaching the Holy Bible to neighborhood kids at the age of nine. He has lots of experience having taught English at Berlitz International Language School- Detroit, taught high school and university English, etc. He holds a Th.D. and several Masters degrees along with a secular degree. He even has a Master of Arts in Islamic Studies from the Institute of the Holy Koran in China where he was a University English professor for three years! Professor Dana Klein M.Div. was born in the French Jewish settled community of Kaplan, La. She holds an M.Div. and has studied at Hebrew University Jerusalem. She taught Biblical Hebrew both in a College setting,and at Seminary level for the last 5 years. She has been an Apostolic Minister for over 30 years and is licensed with the United Pentecostal Church. ​Ministers learn the Bible in it's original languages. Learn to defend what you teach from the Holy Bible. Let us help you to get started on a path that leads to greener pastures and deeper depths as you rightly divide the word of truth in a greater way. The one day seminar works like this. A pastor or organization's leadership contacts us. We confirm a date. Next is our arrival in the morning to prepare for the seminar which could start at 9 am. We will teach students how to read Biblical Greek. Then, they will learn some basic vocabulary and grammar. They will learn to use Biblical computer programs thus putting their newly gained knowledge to work enabling the student to write further indept sermons and Bible studies. The seminar could finish at 4:00 pm. It is a blessing to read the Holy Bible, not just a translation (KJV). These seminars are great for soul winning! Increase your church's membership by inviting those in your community to attend a Biblical language seminar! The church or organization may or may not collect a fee for the seminar. ​The church or organization decides our love offering.